Born Alfredo Bowman and lovingly known as Dr. Sebi. I thank you for sharing your knowledge of alkaline herbal medicine, the African Bio Mineral Balance, and the power of natural alkaline plant food and herbs in supporting health and vitality. You were a vehicle for knowledge that transformed my life and made living so much easier and gratifying for me. I love you for the hardships you have faced in spreading the knowledge of an alkaline diet in the face of adversity. I dedicate to you Dr. Sebi this book Alkaline Herbal Medicine which I hope will serve as a journal of herbal medicine to keep your legacy alive. You live on through us. The African Bio Mineral Balance supports the healthy expression of the African genome in all people. Alkaline Herbal Medicine gives insight into many of the herbs used in Dr. Sebi’s African Bio Mineral Balance to support health and vitality. It covers scientifically supported properties, preparation, doses and dosages, and how to combine herbs. It addresses alkaline foods on the Dr. Sebi nutritional guide, and their chemical affinity with and support of the electric body. The natural order in life designed the body to be healthy and heal under the right conditions. These conditions are programmed into the DNA of Homo Sapiens, whose base DNA makeup is the African genome. Diets centered on the consumption of natural alkaline plant foods and ample exposure to the sun supported the healthy expression of the African genome. The environment of Africa, and environments similar to Africa, produced life that developed with a complete and balanced electrical structure. The plant life that grew in these environments grew under optimal conditions in nutrient rich soil under year long exposure to the sun. The resulting chemical makeup of these natural alkaline plants protected them from environmental stresses. Africans originally ate diets centered on the consumption of these plants, like the great apes of Africa, and the programming of the African genome used the protective nature of these plants’ nutrients to support its vibrancy. A scientific model supports the idea that Africans migrated out of Africa hundreds of thousands of years ago into the less hospitable environments of Europe and Asia. These environments didn’t support the healthy expression of the African genome and resulted in the mutation of the gene and the development of the Neanderthal of Europe and Denisovan of East Asia. Science has linked diseases like lupus, Crohn s disease, and type 2 diabetes to the Neanderthal gene. The Neanderthals, who inhabited the Neandertal caves in Germany, ate diets centered on the consumption of meat. The combination of their meat-centered diet and adverse relationship with the sun led to the development of dis-ease in the body. Now, the meat-centered diet is being globalized and is spreading disease throughout the world*. 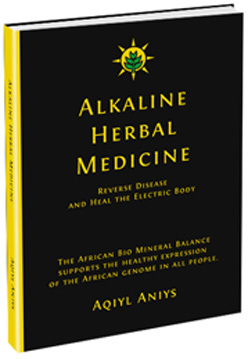 An alkaline plant-centered diet and the use of alkaline herbal medicine naturally support the healthy expression of the African genome in all people. Pharmaceutical medicine is built on the power of medicinal herbs because around fifty percent of its drugs are derived from herbs. The issue is industry has strategically conditioned people to forget about the healing power of natural alkaline herbs. I dedicate this book in the memory of Alfredo Bowman lovingly known as Dr. Sebi. He helped us to remember that natural alkaline herbs and plant foods support the healthy expression of the African genome that is in all people. He did this by sharing his African Bio Mineral Balance methodology.